Texas Tech Peace Officer Floyd East, Jr. Officer Floyd East, Jr., of the Texas Tech Police Department recently responded to a routine student welfare check at the dormitory. Callers reported a 19- year-old individual named Hollis Daniels, who was acting erratically and potentially had a weapon. So Officer East went to Daniel’s dorm room, and he discovered drugs and drug paraphernalia. Hollis, the defendant, was arrested and taken to the station for a standard debriefing. But that is when the intake procedure at the police station went haywire. The defendant was not adequately searched before booking. Suddenly, the dastardly criminal whipped out a gun and fired pointblank into 48 year-old Officer East’s head, instantly killing him. This is a photograph of Officer East. Yet another peace officer, another guardian of the thin blue line, murdered for no reason. The suspect then fled, going on the lam, taking Officer East’s body cam with him. The university went on lockdown, anxiously waiting for the killer to be found. Sure enough, thanks to the quick actions of the Texas Tech police force, the outlaw was located on campus and apprehended again. 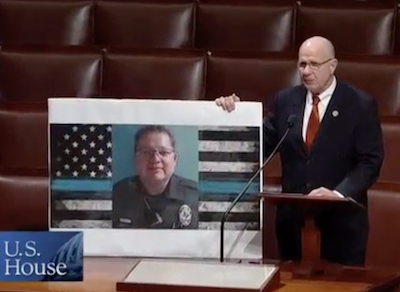 Officer East was an El Paso, Texas, native. He is survived by his wife, Carmen, and two daughters, Anna and Monica. The funeral was a solemn remembrance wrapped up with the release of over 1,000 black and blue balloons, which flooded the west Texas blue sky, all in Officer East’s memory. Army National Guard Armory, officers and military stood at attention and saluted Officer East’s body. Officer Floyd East began his career with the Texas Tech Police Department on December 1, 2014. He started as a security guard at Texas Tech University Health Sciences Center in El Paso, Texas. Academy to obtain his basic peace officer license to be a peace officer in the State of Texas. Court documents show that the defendant, when he was arrested, concealed a weapon in his pants; and when Officer East’s back was turned, the coward drew the weapon and murdered Officer East. The weapon that he had was stolen. The defendant is charged with capital murder, and a $5 million bond is set. May Texas justice occur. Our men and women in blue voluntarily do everything they can to help protect and serve our communities, especially at our colleges and universities. For these remarkable men and women, their safety, like all peace officers, is never guaranteed. While the badge and the uniform represent safety for citizens, for some reason, in our society it becomes a target for other people, like this defendant. Officer East worked with university students, helping protect young Texans eager to learn on their university campus. He was senselessly killed. There is never an answer for murder, except to hold the person who did the murder accountable. The defendant’s friends quickly jumped to the defendant’s defense on-line, claiming Daniels was not a monster. College students do make mistakes. A mistake is like missing class and sleeping in. Mistakes are not murdering people. The defendant is totally responsible for his own actions. He can’t blame the drugs, he can’t blame the fact that he was young, or he can’t blame the fact that he was not thinking right. I was a judge in Texas for 22 years and heard cases like the murder of Officer East. People are responsible for what they do. In our society, we cannot have this feeling that people are not responsible and that something else calls them to do things. People are totally responsible for the choices that they make. I have heard all of the excuses. I have heard: ‘‘Oh, I was too young.’’ ‘‘Oh, I was too old.’’ ‘‘I was on drugs.’’ ‘‘I was affluent.’’ ‘‘I wasn’t affluent.’’ I have heard all of the excuses. There is no excuse. People, like this defendant, are responsible for their actions. Officers like East are a cut above the rest of us, and they protect us from harm’s way and they protect us from evildoers. He is of a rare breed, he is the Texas breed of law officers that sacrifice for the rest of us. Taps have been played for Officer East. He has been laid to rest. We pray for his family, friends, and those officers in west Texas and Texas Tech University.